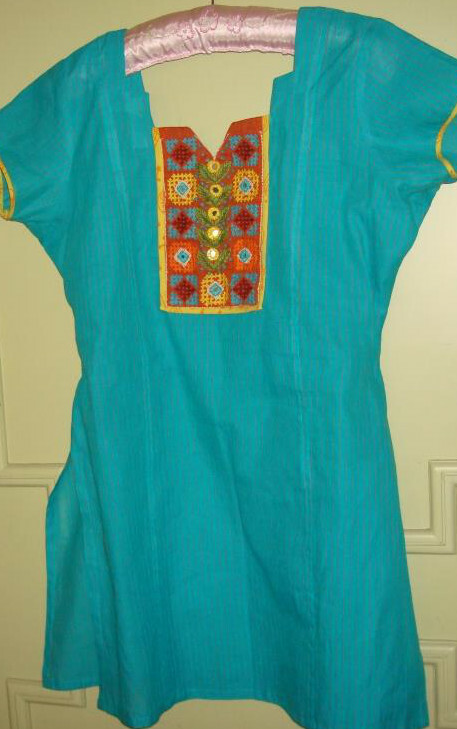 This is the latest tunic where blue is matched with yellow and orange. In Muscat, Oman, we get oxidized silver accessories. Most of them have beads on them. Different shades of corals are available and they are coordinated with turquoise beads. These are feast for eyes in the souq. Mind slowly started generating patterns for projects built on these inspirations. 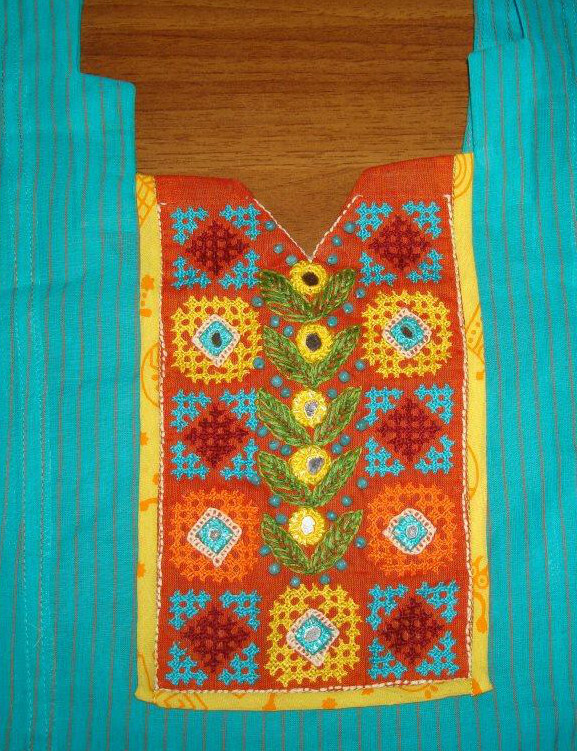 This tunic started with the yellow fabric printed with orange motifs. 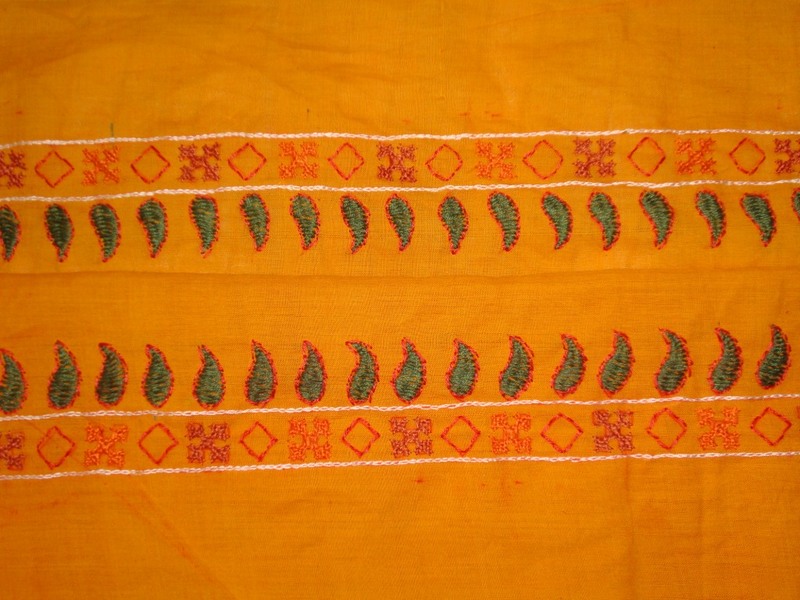 A kutchwork design with allowance for mirrors was drawn along with two other embroidery designs. 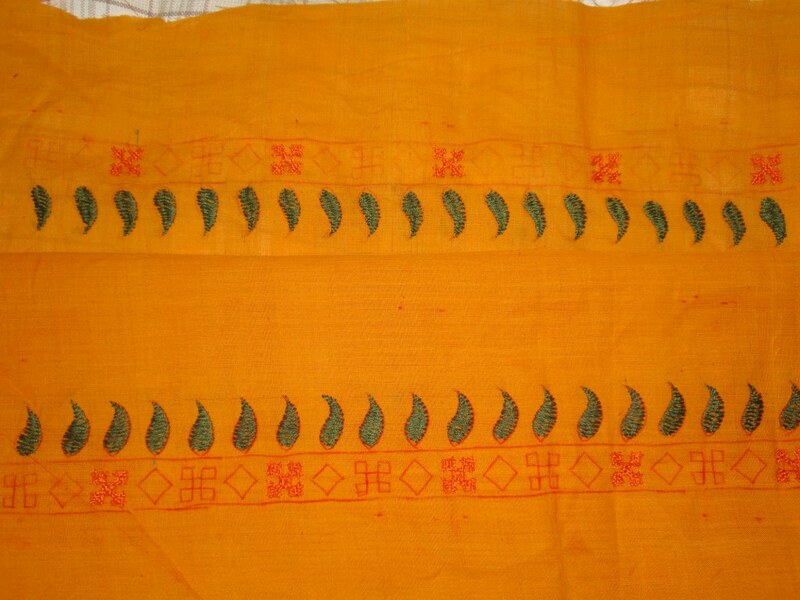 The choice was to work the embroidery on yellow fabric or orange fabric. With the orange fabric being available yellow was the first colour chosen. The next choice was green. 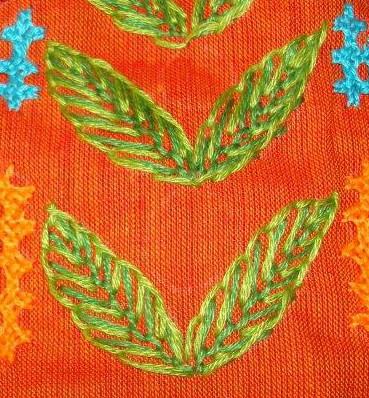 The fly stitches on the leaf pattern. 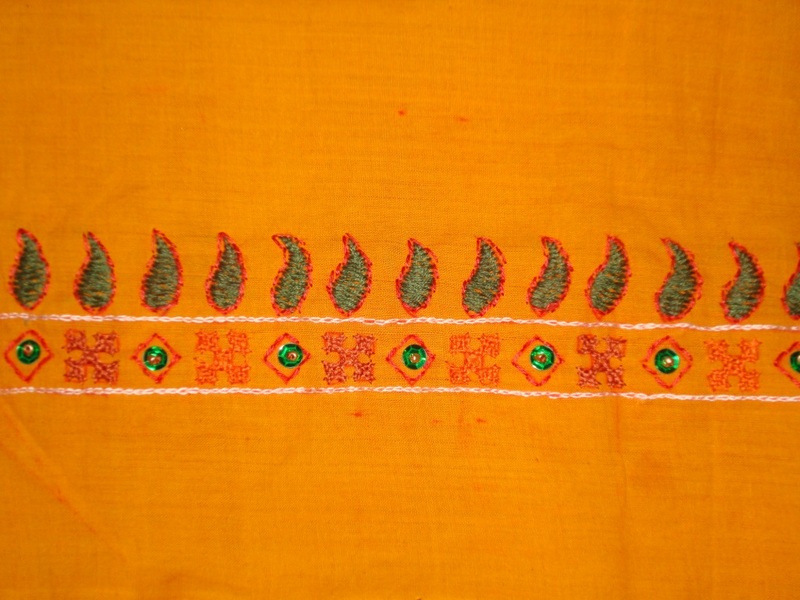 Two kutchwork motifs were worked in orange thread which was lighter than the fabric colour. 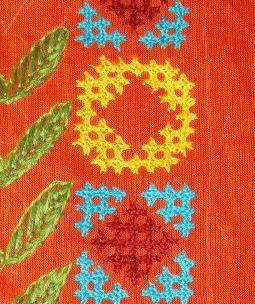 Another motif pattern had an option of being worked in two threads, the central diamond are worked in maroon thread. 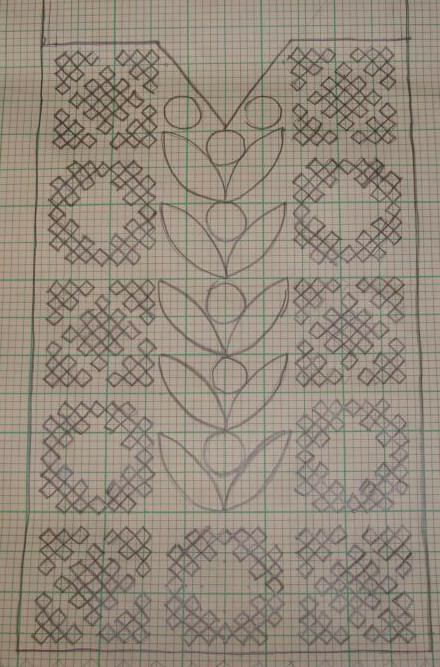 Starting with the idea of incorporating blue into this design, the corners of this square motif was worked in blue thread. 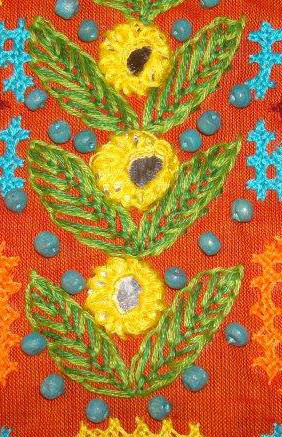 The yellow from the fabric was the next colour, the same motif pattern which was worked in lighter orange was now worked in yellow thread. 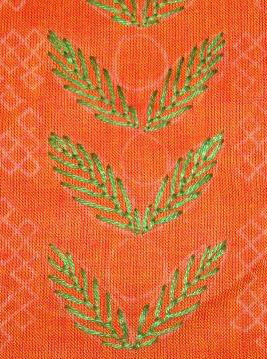 The fly stitches are outlined with buttonhole stitch in lighter green thread. 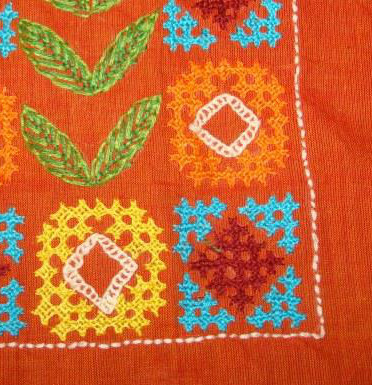 Open chain stitches are worked in white thread to outline the mirrors inside the orange and yellow kutchwork motifs. The piece itself was outlined with back stitch. Mirrors were worked in the same fabric yellow in the space between the leaf patterns. 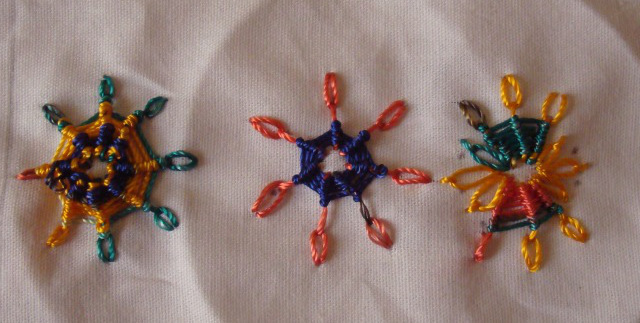 Square mirrors in blue thread are worked inside the square motifs. These blue beads are made of wood and dyed in blue. The blue handloom cotton fabric with stripes was perfect for this set. 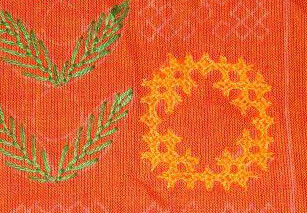 Outlining the embroidered piece and the sleeves with the yellow orange fabric was a good choice. Though this idea was mine, I could see the satisfaction in my tailor’s eyes. He is quite stingy with praises. 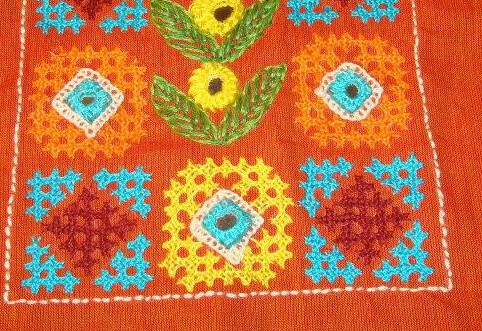 The details of the embroidery done on yellow fabric for the yoke . 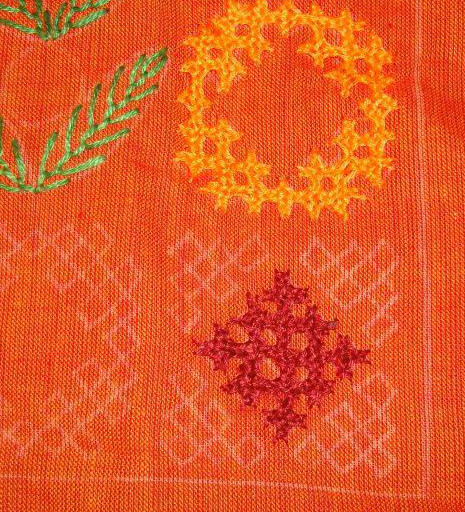 the border is the same as sleeves except for paisleys. 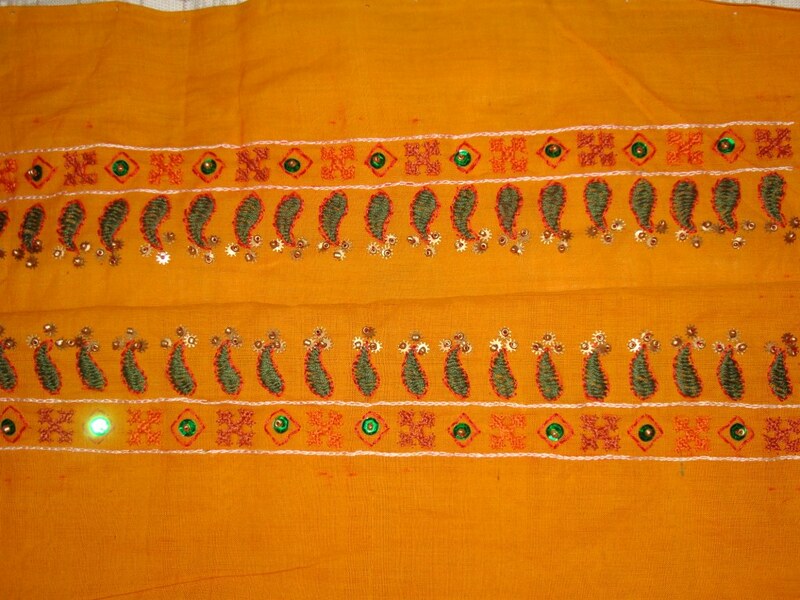 The border with orange kutch motifs and green paisleys. 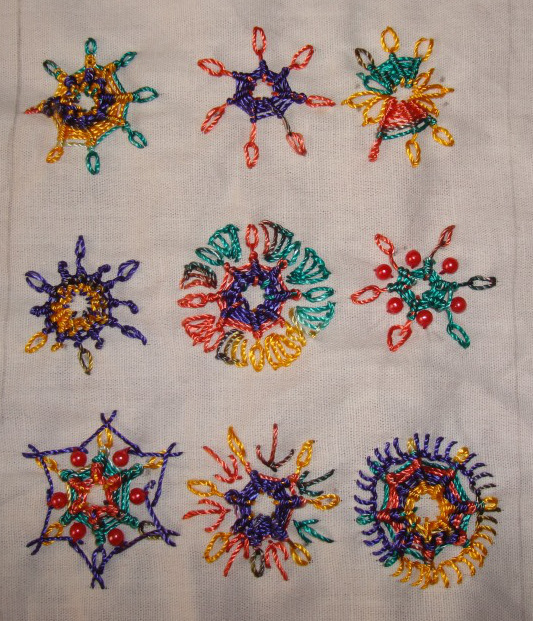 The paisleys and diamond shapes outlined with red thread in back stitch. 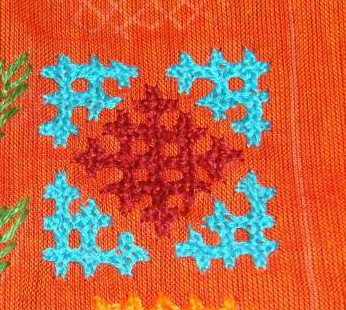 The rest of the kutch motifs worked with brown thread. Chain stitch borders in cream thread, and green sequins attached with gold beads. The completed yokes and tunic on my next.